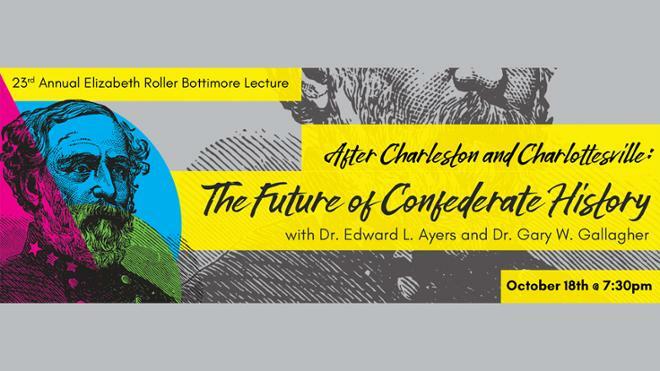 “After Charleston and Charlottesville: The Future of Confederate History” focuses on what historians have learned about society’s understanding of the Confederacy over the last several decades and where our focus should be moving forward. The discussion will feature two of America’s most prominent Civil War historians, Edward Ayers, University of Richmond Tucker-Boatwright Professor of the Humanities, and Gary Gallagher, John L. Nau III Professor in the History of the American Civil War at the University of Virginia. Ayers is also the author of The Thin Light of Freedom: The Civil War and Empancipation in the Heart of America, a 2018 Gilder Lehrman Lincoln Prize and Avery O. Craven Award winning book that recounts the lives of the ordinary men and women of the Civil War. This event is the Department of History’s annual Elizabeth Roller Bottimore lecture. The lecture is currently sold out, but there is a waiting list. Media wishing to cover this event should RSVP to Lindsey Campbell by Tues., Oct. 16.